Art Prostitute Grand Opening THIS Saturday! Currently living and working in Los Angeles, Dave Kinsey is widely known for his social commentary delivered through his portrayals of characters from the city streets. While the idea of using the urban landscape as a canvas remains a constant, he continues to show his fine art in galleries in Los Angeles, London, Paris and New York among others. He was recently invited to exhibit at the URBIS Museum in Manchester and has been featured in publications such as The New York Times, Lodown and Black Book. Born in Pittsburgh in 1971, Kinsey is part of a growing dimension of urban contemporary artists changing the scene of traditional and non-traditional art and visual media. After attending the Art Institute of Pittsburgh, with an emphasis on fine art illustration, he honed his design skills at the Art Institute of Atlanta, graduating in 1993. He moved to the west coast a year later to pursue a job offer and started the creative design agency BLK/MRKT. Its success allows Kinsey to continue his path as an accomplished designer and contemporary artist. Hello everyone. Just wanted to make sure you were aware of the party tonight with A- Trak. He is on tour with “The Rub” djs from Brooklyn nyc. This party is deffinatly something you will not want to miss out on. I think the night starts a little early….see you out. There will be live painting by Will Rhoten of Decade Clothing alongside live screen-printing of images Brian Gibb of Art Prostitute. Lust for Life. Metropark is the decisive lifestyle shopping destination for today’s trendsetting young adults, blending fashion, music, and art to offer a rare and inspiring shopping experience. Part club, part street boutique, we are fast becoming famous for our carefully edited multi-brand fashion assortment and dynamic atmosphere. Our customers have quickly come to trust Metropark for our unmatched product offering featuring fashion designers typically found in the small street boutiques of major metropolitan fashion centers. We are committed to enable the most discriminating trendsetter to develop a wardrobe representing the most current and relevant fashion brands and styles. Come by Metropark this weekend to see the hottest local DJs spinning live! We’re not your typical mall store, so expect the unexpected at Metropark! Saturday May 20, 2006 // 2pm -10pm // The event is free to the public. Tasting ticket includes: a glass, a wine diary, 8 taste tickets and a goody bag full of coupons, give-aways, and deals from local businesses. There will also be food, beer, art, clothing, accessories and more available for purchase at the event. Ticket sales go to benefit the Greater Denton Arts Council and Riding Unlimited. For an additional $10 participate in the Blind Taste Contest for a chance at the Wine Einstein Trophy. Contestants will taste 8 wines and attempt to discern the grape, the region and vintage of the each wine as well as giving a full aroma/ taste profile of each. Contestants are judged not only on accuracy but on their ability to make a case for their assumptions based on the characteristics of the wine. The Grand Prize Winner will receive dinner for 2 at a local restaurant, a rare bottle, and a free taste at Wine≤ per week until 2007! Runners up will receive wine accessories, bottles of wine, and t-shirts. It is going to be going on this Wednesday! 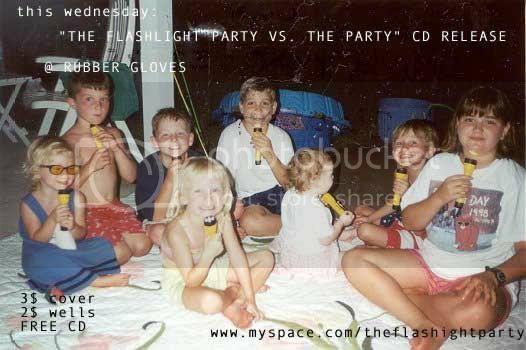 The Flash Light Party will be battling The Party in a one on one dj deathmatch. Well nobody is going to die but the tables are going to be hot Wednesday. The Flashlight Party is releasing a mix cd this night. Don’t miss out and here about how the party was. See you kids out! Shout out to my man Ben…CTRL, AtL, Delete!!!! I read this post on the dallasblog.com regarding the upcoming Grafitti Wipeout. I’ve had conversations before with quite a few people on this issue. WHY IS THE GRAFITTI ABATEMENT COMMITTE THE ONLY PROGRAM THAT HAS SUCH MOMENTUM IN DALLAS!? It baffles me that there are other major issues in Dallas happening at the moment that have miles of balled-up red tape surrounding them, but getting rid of grafitti…well that’s all green lights and paved roads. Yes, grafitti is a crime due to property damage and maybe tresspassing, BUT the criminals are just art kids from the suburbs! It seems that Dallas still has this 1980’s mentality that grafitti is connected to street gangs. So in the process of “cleaning up the streets” from grafitti, then they are thinking that they are discouraging the gangs from being attracted to those areas and robbing and shooting them up. So in the plea to clean up Dallas, they have convinced corporations and volunteers to contribute their money and time to feel like that have “made a difference” in their community just because there is fresh paint on a wall…ha…it’s the same notions that compelled those art kids from the suburbs to paint there too!!! To make a visual change. To make a personal contribution. To be seen and heard. This past weekend I went to Double Wide for the first time since they re-opened, and it was a good time. What is really great about DW is that you can see a band, have some drinks on a patio or at the bar, as all three are separate areas, which means if you are not feeling the band you don’t have to pay a cover to stay and drink, you can just go to the bar and rock the juke. Above all it made me realize how those of us who live and work in Dallas have to support places like this if we ever want it our city to reach its full potential. There is always talk about crime and safety issues, but what major city doesn’t have that problem? I for one have found parts of LA and NY far sketchier than Dallas. You just have to be smart when you are out. What really brings out the worst in an area is when there is nothing going on. In those dead parts, where no one is around, is where most crime happens. The more businesses that open and stay open the better. So next time you are out think about that before you leave your hood for greener pastures. The grass maybe a tad brown right now, but it is amazing what a little water can do.